Construction: PVC cover with polyurethane liner and rigid PVC helix. Oil Resistant Polyurethane Liner – Resists most animal and petroleum based oils. Thick Abrasion Resistant Polyurethane Liner – Designed for dry applications where severe abrasion is a factor. 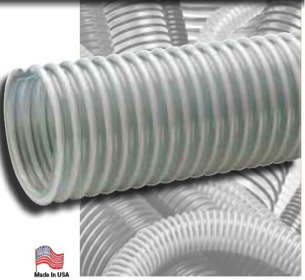 Provides for longer hose life and lower operating costs versus rubber or PVC hoses. Transparent Construction – “See-the-flow.” Allows for visual confirmation of material flow. Static Dissipative Cover – Specially formulated to help prevent the build-up of static electricity for added safety and to help keep material flowing smoothly. Convoluted Outer Cover – Provides increased hose flexibility. “Cold-Flex” Materials – Hose remains flexible in sub-zero temperatures.